Ken and I have often reflected on the possibility of required classes in school for children and young adults that would teach them about managing their finances; we all need to know about how these things work, regardless of what we want to do for work!. As it is, it’s particularly important for us as parents to teach our children financial literacy. I put together a list of some ways to do that with your kids. Some of these we have done, some we are about to do and others we are looking forward to doing as our kids get older. I’ll break the ideas up into three groups based on age. 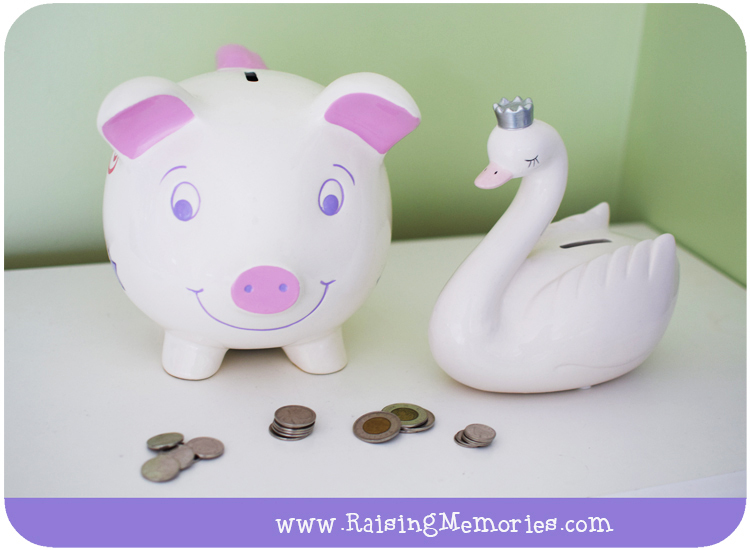 From a very young age, children can learn about money and why saving is important. Talia received her first piggy bank at a baby shower just after she was born, and that was the start of her financial learning! As soon as she knew what money was and received a little bit of it, we taught her about keeping it in her piggy bank and saving it for future use. Saving is a good first step, but the lesson becomes even clearer through experience when your child wants to buy something! We’ve tried to teach our kids that it’s not always wise to spend money right after you receive it or just because you have it. Talia learned this lesson when she spent all of her money (fun at the time!) at the market, and soon found she no longer had any money and had to wait until she had saved up again before she could make another purchase. I think experiences like that are instrumental to their learning, because they will really remember how things work when they have had a chance to experience it for themselves. Another good learning experience is saving up for a specific item. When we were preparing for our trip to Florida, Ken’s mom told the girls they could earn money by helping her with some things at her house. They wanted some extra spending money at Disney World for themselves, so they were able to work with an end goal in mind. 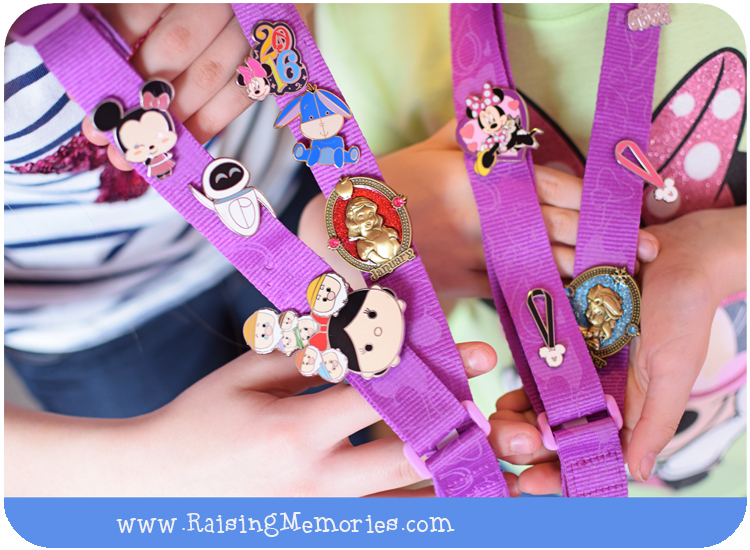 They were very interested in pin trading at the park, so they each purchased some and the pins they came home with are treasured mementos from our trip! Another way to save with a goal in mind is to create a bank for a family goal (such as a family trip to Disney World). This is a great reminder to the kids that it takes time and effort to save enough money for something like that! You can give your kids the opportunity to earn money by providing an allowance or allowing them to earn money by doing extra chores that they are not usually required to do. When your child is old enough, you can take them to the bank to start their own bank account. I still remember doing this with my dad. I remember choosing my PIN number and getting my own bank book. It felt so grown-up to use the bank machine for my very own account! Have your child help you make a grocery list and help them be aware of the cost of things by looking at flyers and prices at the store and sharing the budget with them. This way, they can work with you to figure out what to buy that fits within the budget. It’s a good way to help familiarize them with the cost of things. You can do this with younger kids by telling them they can each choose a special treat at the grocery store, but must remain within a certain dollar amount. Another way to help familiarize them with cost is to share what things are costing (e.g.. bills, eating at home vs. a restaurant, gasoline for the car, etc.). I remember the moment our girls realized that it cost money to drive somewhere! We were surprised to realize they hadn’t thought about it. It might be a good thing to point out next time you’re filling up the gas tank! 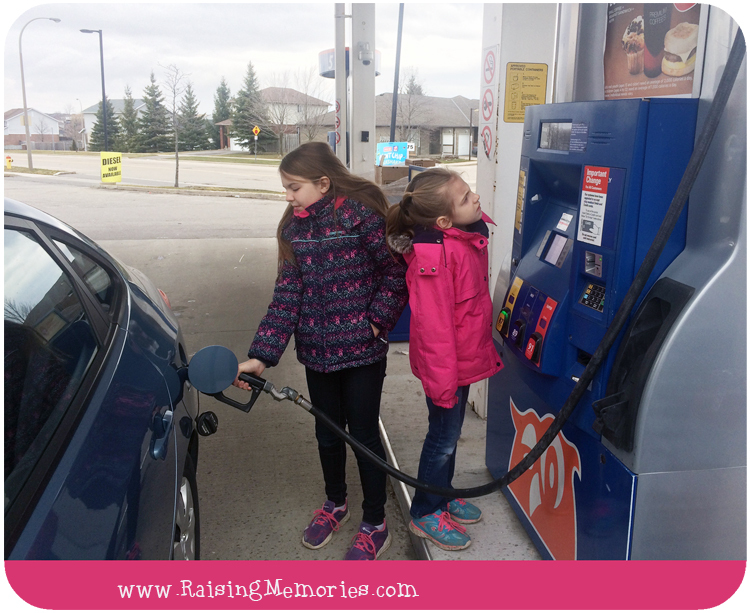 Our kids like to help at the gas pump; if your kids are the same, you could make a point of keeping them there with you while you’re paying for the gas too! All of this has a lot to do with thinking ahead and being prepared for the future. As you’re talking to your kids about what they want to be when they get older and their dreams for the future, you can also help them understand the role that school plays in making those dreams come true. Teach them about the cost of school, and help them understand how saving for school early can make a big difference when the time comes time to pay for it! When your kids are old enough to understand the concept, teach them about compound interest. I bet they’ll be excited when they realize the benefit of saving with an RESP–that’s the glorious moment when they`ll understand it all enough to thank you for starting one for them back when they were younger! Save with a goal is a great one. My kids do that and are good at it. That's because we started this learning process early. Another thing I like to do often is quiz them just at random. How much do you think that cost? Might even be something like a bag of croutons which was out last night when we were making salad. She noted how little was in the bag and said what a rip off then I said well, how much do you think it cost? She said $4. I noted at $1.99 it really wasn't a bad price at all. I think that helps give perspective sometimes too. I have one kid who is amazing at saving money but also spends it on a whim. You are right that they really have an eye-opening experience when they spend all their money and have to save again. Such great advice! I've tried to teach my kids about money since a young age, but I know I could have been more consistent with certain messages. These are fantastic tips! My mom gets the kids to help her out for money too. And it's interesting to watch the kids with the money they've earned, because they hold onto it much more carefully. If Mom and Dad are willing to buy, they're all for it, but not with their own money. ;) I wish we had started saving sooner for their post-secondary, but we have some at least, and a few years to go! Great tips! We too have started to teach our kids the true value of money! This is probably one of the most important life lesson we can teach our kids. Thanks for breaking it down simply and by age. I completely agree and we opened a bank account for our son last summer when he was 5. He's learning so much about saving and spending even though some concepts are still hard for him to understand (like using his debit card to pay for purchases and how the money will be automatically withdrawn from his bank account). Great conversation to have with the kids either way and they're never too young either. I'm teaching my kids want Vs need with their financial choices. It helps with deciding about saving/spending. This is such a great post because a high number of people today don't know how to be responsible with money. Most people today are so deep in debt and they live paycheck to paycheck plus they live off of their credit cards. I only use my credit cards to collect points and I never spend more than I make but most importantly I pay it off every month so I don't pay interest. I think you are doing a great service by teaching your kids about being responsible with money and hopefully it'll pay off in their future. This is important. I know so many young adults that have so much silly debt.